Zfone and its innovative encryption technology sets the standard for securing VoIP phone calls. Zfone lets you whisper in someone's ear from a thousand miles away. 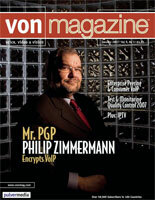 On the cover of VON (Voice On the Net) magazine.